The mix-and-match composition of this multicoloured crepe Dresmine dress nods to Mary Katrantzou's signature eye-bending prints. 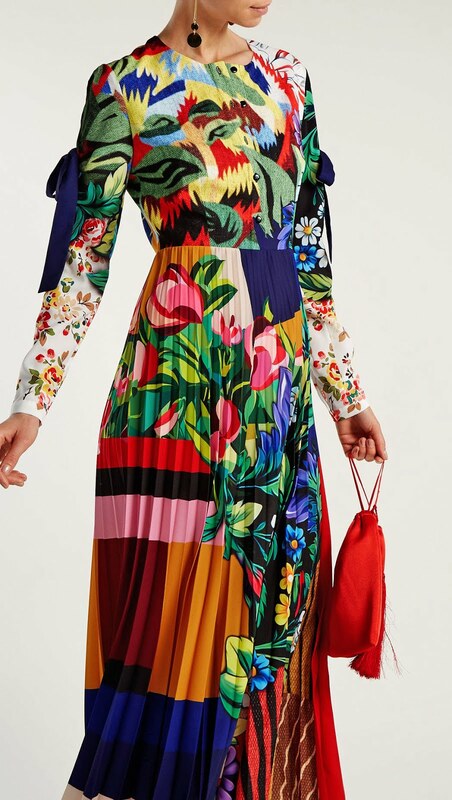 Made in the UK, it's shaped with long sleeves that are slit open on the outside and secure with navy ties, then falls into a sweeping pleated skirt, that showcases a vibrant selection of Cubism-influences, colour blocking and exotic florals. Pick out one of the deep red hues with a coordinating satin pouch. 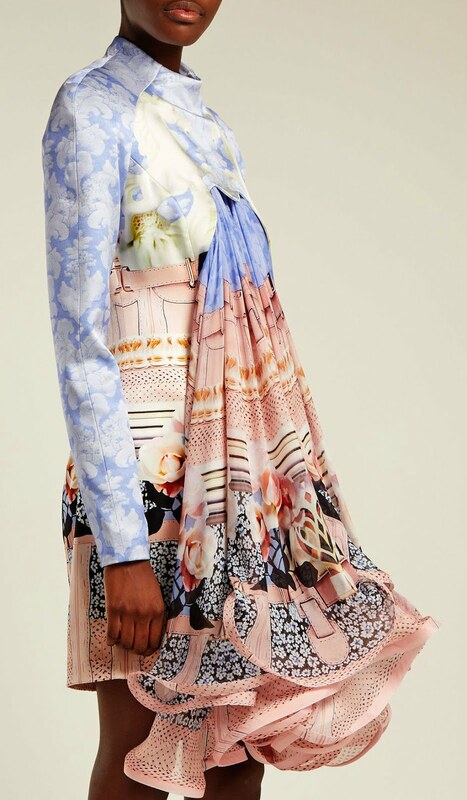 Mary Katrantzou revives this multicoloured Powdy dress – originally a standout piece from the AW12 collection – for the 10th anniversary of her eponymous line. Exclusive to MATCHESFASHION.COM, it's crafted from a mid-weight silk printed with the label's hallmark kaleidoscopic prints that enliven the structured foundation. A semi-sheer panel at the front cascades to a ruffled hem. Follow up the pastel hues with soft pink heels. From the first look on Mary Katrantzou’s AW18 runway show, this black Rooster dress has been re-released in celebration of the label’s 10th anniversary exclusively for MATCHESFASHION.COM. 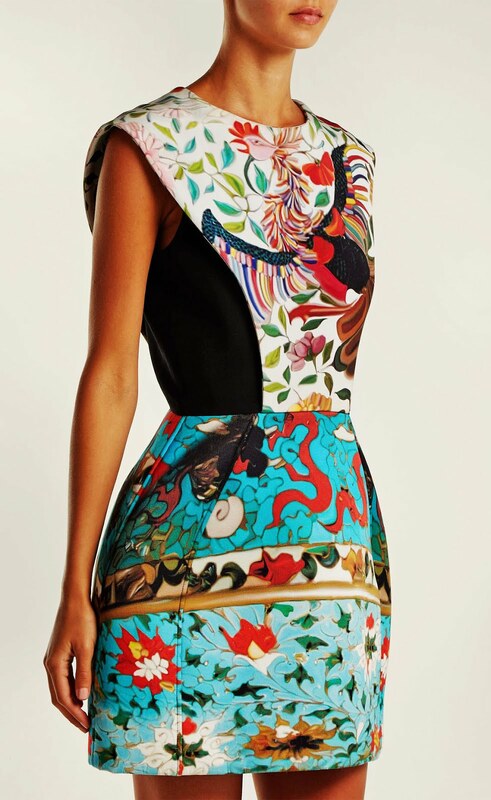 It’s shaped to accentuate the female silhouette and is patterned with contrasting floral prints inspired by Fabergé eggs. Keep the statement piece in focus with delicate jewellery and heeled sandals. 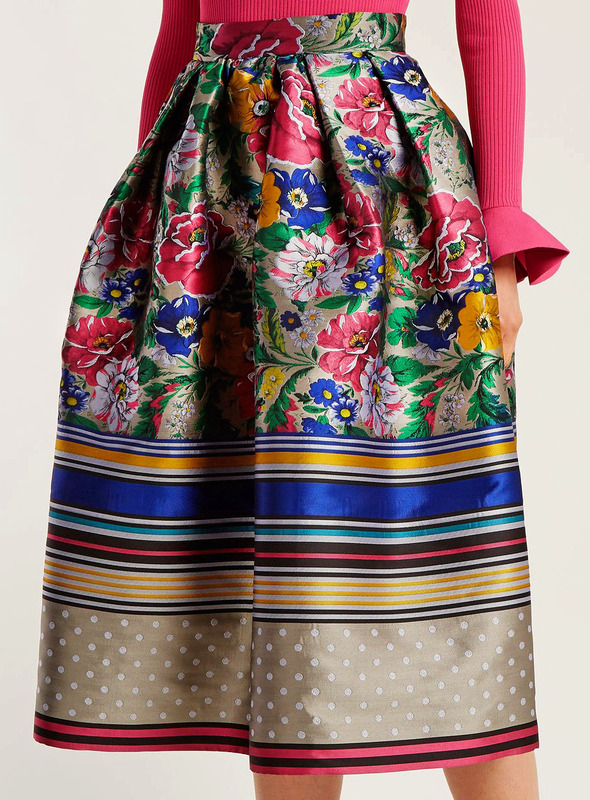 Pick out the bold pink hues from Mary Katrantzou's multicoloured floral jacquard Bowels skirt by styling it with a hot-pink sweater. The hyper-feminine silhouette is the product of fine Italian craftsmanship, featuring a high-rise waist and deep inverted pleats to create dramatic volume, and features graphic stripes integrated into the pattern along the hem. Add a pair of pointed pumps for an intimate evening occasion, finishing your look with a swipe of berry-tone lipstick.